Orange County Roofing is a full service roofing company that will gladly fix your leaking roof. We can quickly locate the source of the leak and have it patched, sealed, or replace damaged or missing shingles. Our experienced team of roofing professionals will work quickly and efficiently to stop the leak and undo any damages your roof has incurred. We are fully licensed, insured and prepared to serve all your roofing needs. Big, small, skillion or gabled, Orange County Roofing can repair it, with a measure of quality that's unmatched by the competition. 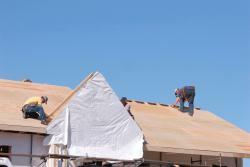 Orange County Roofing offers free estimates on any job. When you receive a quote from us, you can rest assured that price will be the only you'll pay and we'll never tack on any hidden fees or extras mid-job. If your roof leaks, don't wait until the problem escalates, call Orange County Roofing today!